What can we say about America’s absurd copyright laws that hasn’t been said better already? Readers of The Seattle Star know where we stand. But in case you’re unclear on how our bunk copyright laws ruin your life, consider music. You know about Napster. You know about moms being sued for recording their 6 year olds dancing to Prince. The list of these ridiculous things that stem from hyper-aggressive litigation goes on. But there are worse effects that you probably don’t notice. Many of my friends lament how dull hip-hop has become since 1994. It’s an arbitrary year, but their reasoning stands: the music has become too simple and repetitive. It may seem like a matter of taste but it isn’t: it’s because samples have become ridiculously expensive to clear, so musicians have taken to using as few as possible. This is a far cry from the complex sampling of Public Enemy or other artists of that era. For instance, it cost the Beastie Boys about $250,000 to clear the rights for Paul’s Boutique. Adjusted for inflation, that album would now cost well over $25 million. Because the basis of hip-hop — spontaneous quotation — is largely illegal. Consider now what if the same rules of Grand Upright Music, Ltd. v. Warner Bros. Records Inc. applied to jazz in 1917. Rhythm and blues in 1954. Or, hey, liturgical music in 1600. None of these musics would have gotten started. Confused? You should be. Then you should be outraged. 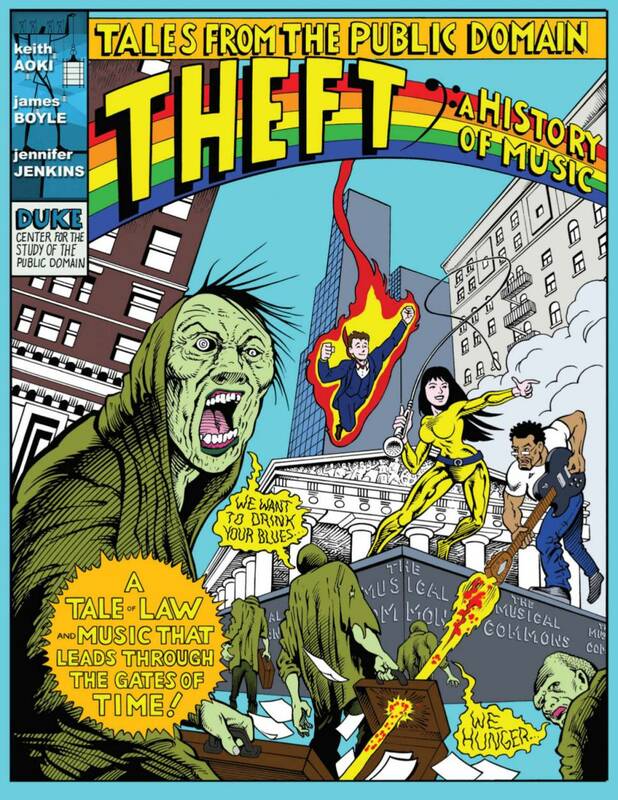 Theft: A History of Music condenses all the things wrong with current copyright law in a story of 2000 years’ worth of attempts to control the power of music into a fantastically readable comic book. By the end, you too will have warm fuzzies. Okay, maybe not, but you’ll be a whole lot more aware of what’s at stake for your culture and your personal listening habits. I read this book in an older version, but it’s been redone since the death of the original artist, Keith Aoki and re-released just this year. The new team of Ian Akin and Brian Garvey are pitch-perfect in their honoring of Keith Aoki’s work. One couldn’t have asked for better. We’ve featured Jennifer Jenkins and James Boyle’s work at The Star before, but this is even better than their other work, more direct and more comprehensive, but just as funny and witty as Bound By Law. I highly recommend you read it. And if you like it as much as I do, buy a copy of the printed book for your library and keep the creative team inspired to crank out more books. Buy the handsome paperback here.